THE full details can now be revealed why former owner Craig Whyte was banned for seven years from being a company director back in 2000 – a damaging fact that Whyte hid from football and City regulators when he acquired Rangers in May last year. I am just going to let this speak for itself. Anyone that wishes to challenge the piece, feel free to do so. Stolen from one of them Rangers forums. ANY Rangers shareholder has the legal right to challenge the deal which saw David Murray sell the club to Craig Whyte. That is the astonishing news I can exclusively reveal, as Rangers supporters rally to save the club and free it from the tainted grip of the now seriously under scrutiny Whyte. David Murray, in typical style, muddied the waters last week when he claimed there was no legal mechanism in place for him to reacquire Rangers, even if Whyte had not fulfilled the obligations he signed up to in the contract which transferred Murray’s majority shareholding to him for a quid. However, what Murray did not make clear is that under corporate law, which covers the terms of the agreement, any Rangers shareholder who does not believe Whyte has fulfilled his obligations CAN challenge the deal in court. There are 26,000 small Rangers shareholders out there and each and every one of them has the legal right to step up and challenge the legality of the deal. That’s a lot of people from diverse backgrounds. 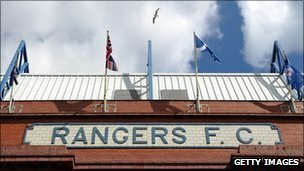 And the 26,000 MUST include Rangers supporters who are lawyers, accountants , wealthy and successful businessmen, and others who know the ins and outs of corporate law and takeovers. I believe one of them may be preparing just such a move. And it would explode as a bombshell for the beleaguered Whyte. It would also of course drag David Murray back into the mess, though some would say he has a moral obligation to help clean it up, as the mess was of his own making. However, any such move, would also make it easier for Paul Murray to move in and start returning Rangers to a sound and safe financial footing. In fact, if more than one Rangers shareholder instigates a move against Whyte, that would put the Whyte camp under even more pressure and allow the contract between him and Murray to be forensically examined under the public gaze in open court. Rangers supporters would then get the chance to see just what conditions David applied to the contract which he and Whyte signed, the deal which as led to Rangers being placed in administration and having ten points deducted, effectively handing the title to Celtic. THERE will be more tomorrow on this astonishing development and how it could even boost the Ibrox finances. It would appear that, as sure as the sun doth rise – the debate over Rangers past shall continue. In the past week Craig Whyte has released a trendy niche of sound bites in relation to the ormer Ibrox rear-guard, and by this I do not refer to Messer’s Gough and Brown. The slagging match continues; and I use the word ‘slagging with’ deft apt: that’s all that it is. What’s going on financially then? One thing is clear – if we are prepared to run with Craig Whytes Rangers Football Group as the owners of Rangers there are some interesting financial movements going on at Rangers that are easy enough to find online.